WHO: Frank Capra directed this film starring May Robson and Warren William. WHAT: The first film made at then-tiny Columbia Pictures to receive any Academy Award nominations, it was in the running at the 1934 Oscars for Best Picture, Director, Adapted Screenplay and Actress (for Robson as "Apple Annie", a an aged peddler who is remade into a high-society matron for the benefit of her visiting daughter). It won none of the above awards, although Capra thought he had won the directing award when host and presenter Will Rogers called from the stage, "Come and get it, Frank!" when announcing the award. 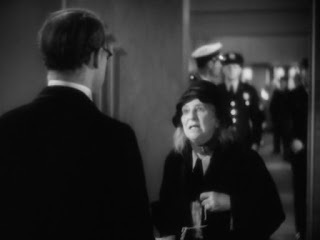 He meant his fellow Fox Studio employee Frank Lloyd for Cavalcade, however, leaving Capra embarrassingly standing in front of the stage speechless as he realized on his way to the podium he'd made a (perfectly understandable) mistake. It was not so much that the story had a seventy-year-old heroine but that it was not a conventional star vehicle. It was a truly democratic story. Each character was equally important. Even the nominal lead role of Apple Annie was merely the centerpiece of a fragile fairy tale that to an unusual extent depended for its credibility on the interaction of an entire community of characters. WHERE/WHEN: Screens tonight only at 7:30 at the Stanford Theatre in Palo Alto. WHY: The Stanford's Summer calendar is winding down now that it's September, with only four pictures to go, all starring Deanna Durbin, who was subject of a full retrospective last Winter and died at age 91 this past Spring. These four include Durbin's most uncharacteristic picture and one of her very best (along with His Butler's Sister and The Amazing Mrs. Holiday, in my opinion), the Robert Siodmak noir Christmas Holiday. It sounds like a charming film but goes to far darker places than even Capra's It's A Wonderful Life in its depiction of Durbin as a prostitute and Gene Kelly as a... but no, I won't give it away. This film is something of a premonition of the next Stanford series, a dual focus on Humphrey Bogart and film noir running September 14 through November 10. Unfortunately, the theatre will go back to a four-day screening schedule after the initial nine-day run of Casablanca and The Maltese Falcon (Sep. 14-22). But the good news is everything will be shown in 35mm prints, and that every Thursday-to-Sunday weekend will pair one of Bogie's most popular pictures with a top-quality crime picture from approximately the same era. The two bookending bills in this pattern are knockouts: Bogart and Lauren Bacall in To Have and Have Not arrives with Robert Mitchum and Jane Greer in Out of the Past September 26-29, and my very favorite Bogart vehicle In A Lonely Place is paired with one of the all-time great noirs Gun Crazy November 7-10. In between are a number of other strong pictures (The Third Man, The Treasure of Sierra Madre, Touch of Evil, etc.) as well as a few I've never gotten around to seeing (namely, The Blue Dahlia, Key Largo and The Caine Mutiny). I'll be tempted to go every week! these films are a treasure trove of such players.His 1961 remake with a somewhat campy Bette Davis as Apple Annie was a sad way for him to biow out. I've never seen Pocketful of Miracles and have little desire to at this point. Maybe after I've filled in more important Capra gaps like American Madness and some of the other pre-codes especially.